A motorcycle crash is an incident that one would want to easily forget or erase from the memory. Over the years, many have lost their arms and had several parts of their body severely damaged. The truth is that after a motorcycle crash, it is very difficult or quite impossible for things to go back to how they were. This unfortunate circumstance has ended many dreams and destroyed several families. A motorcycle accident like an auto accident is mentally torturing, physically and financially demanding. This is because a lot of money is spent on hospital bills and securing drugs or even paying for surgical operations. All these and many more are some of the reasons why every motorcycle accident victim requires the services of a capable motorcycle accident attorney. At Rawa law group, we have a team of qualified lawyers who offer helpfulness to accident victims. We offer personalized representation and give individual attention to all our clients. We put ourselves in their position and offer to meet you at your home or in the hospital. Our major focus is to seek ways to maximize your accident claim settlement. 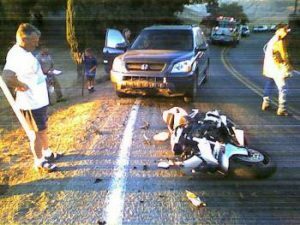 When you hire our car and motorcycle accident attorneys, there is no upfront cost. Also, you do not get charged for case evaluation as it is absolutely free. Our payment method is flexible and transparent and there are no hidden charges. In fact, we do not get paid unless we win your case and this makes us focus on giving you the ethical legal counsel you can get. We have been long in this business and we have over 55 years of combined legal experience. Another reason for you to consider us is that we keep you informed of your case from start to finish. If you or a loved one needs to hire the services of a qualified motorcycle accident attorney in Hesperia, kindly reach out to us.